Container technology is the current trending topic in the computing world. But why? The reason for this is that containers are what will make machine abstraction possible that is, transforming a computer from being a thing to being a place. 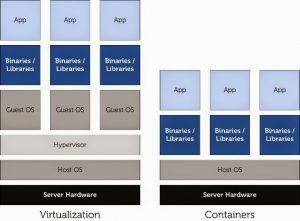 But before we can delve into container hosting technology, it’s important to first have an understanding of how Virtual Machines, which preceded containers, work. In a nutshell, A Virtual Machine is the software abstraction of a computing system that runs on a physical host server. Configuring a Virtual Machine can be likened to purchasing the standard computer machine, that is, you have to define the desired disk storage and RAM capacity as well as the number of CPUs. After the configuration process, the next step is to install the operating system and other applications or servers that you would like the Virtual Machine to support. In essence, a Virtual Machine allows a user to run several simulations of a computing system on a physical hardware host machine. However, one of the major drawbacks of Virtual Machines is the fact that they do not allow for the leveling of resources as it purely owns the resources that it is provided with. This brings us to the container hosting technologies. If we look at containers at a conceptual level, they are Linux processes that are the only running processes. Such processes only know about the commands once they are told to know and execute. Additionally, each container process is assigns a unique IP address making it identifiable within the hosting network. This way, a user can issue commands to the container manager to paste the specific IP address of a container to an IP address on host machine that can be accessed publicly. Once this happens, the container becomes a unique machine that’s accessible on the host network, akin to a Virtual Machine. Containers share resources on the host machine in a cooperative fashion. Again the allocation of memory, CPU and storage resources is very dynamic unlike the static nature of Virtual Machines. These sharing processes are managed by the container hosting manager. One of the major benefits of container hosting is that it allows users to get the encapsulation and isolation of Virtual Machines without the downside of dedicated and static resources. In addition, the fact that containers load very fast into memory, users get the optimal performance when scaling up. The benefits of container hosting derive from the lightweight nature of containers meaning more and more containers going well into the thousands can be put on a single server. Containers are shareable meaning that they can be used on a host of private and public cloud deployments, speeding up development and testing by packaging all applications and their dependencies within a short duration. Container hosting technology picked up where the Virtual Machines left off providing internet users with the best and most profitable online presence. If looking to subscribe to container hosting, here are some of the top providers. It’s important to bear in mind that container hosting is a new venture for traditional Cloud providers and you are likely to get the benefits of both container hosting and cloud hosting. Internet users are therefore advised to carry intensive research on the various providers to ensure the services they are providing are in line with their business or overall online needs. Once you are in agreement as to the package you need, go ahead and start enjoying the amazing benefits of container hosting.